PRODUCT: 100 Foot Long 10/3 SOW Grade Rubber Power Cord, 250V, 30 Amp L6-30 Twist-Lock Plug and Outlet (30A 3-wire, 2-pole). Price/Each. APPLICATIONS: Construction grade cord is ideal for hot air welders, large power items. 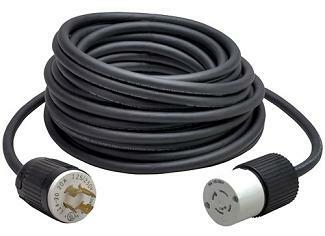 These heavy duty power cords are designed to supply 30 amps using 2-pole, 3-wire @ 250V. 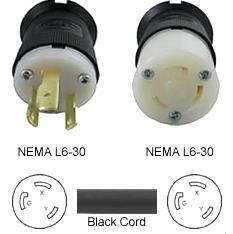 L6-30C (L6-30R) FEMALE ELECTRICAL PLUG, UL/NEMA GRADE, 30 AMP 250V, 3-PRONG FEMALE TWIST TYPE LOCKING POWER CONNECTOR. PRICE/EACH.